Nestled in the bustling shopping and financial district in Dubai, the Conrad Dubai is only a few minutes’ drive away from the Dubai International Airport, Burj Khalifa and Dubai Mall. This marvellous hotel in Dubai features accommodations with magnificent views, five ingenious restaurants and entertainment settings, well-appointed spa, yoga pavilion, gym and an outlandish outdoor pool. Every ultramodern suite features modern and lustrous décor and a separate room. When it comes to dining, the hotel is simply one of the best in Dubai. The Ballaro Restaurant in the hotel offers buffet breakfast and lunch in international cuisine. 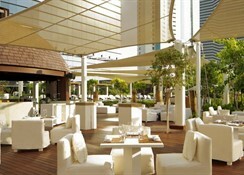 It offers a la carte Italian cuisine for dinner and Mediterranean cuisine every Friday. 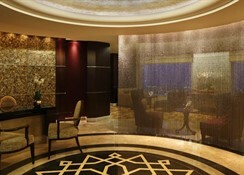 The Conrad Dubai is ideally set on the Sheikh Zayed Road, Dubai. It is only 1.3km away from the Dubai World Trade Centre and the Dubai Mall is only 6km away. It will be an exciting stay for the beach lovers, as the Jumeirah beach is about 11km away from the hotel. The Dubai International Airport is only 10km away from the hotel, making it convenient for the guests to board their flights on time. The hotel's 555 wide-ranging guest rooms, suites and executive rooms are categorized as King Deluxe Room with Sea View, Two Double Bed Deluxe Room with Sea View, King Deluxe Corner Room, Two Double Bed Deluxe Suite, King Deluxe Room with Skyline View, Two Double Bed Deluxe Room with Skyline View, King Executive Suite, Family Two-Bedroom Suite, King Deluxe Suite, King Executive Room, Royal Suite and Two Double Bed Executive Room. All rooms have large number of amenities, including air conditioning, alarm radio, bath slippers, bathrobe, bathroom television, bidet, clock radio with mp3 connection, ergonomic desk chair, on-demand video games, seating area with sofa, separate bathtub and shower, separate toilet area, flatscreen TV, thermostat (adjustable), and much more. The Condrad Dubai offers mouth-watering food and drink at the three captivating restaurants and bars, Bliss 6, Ballaro and Cave, for its tasteful guests. 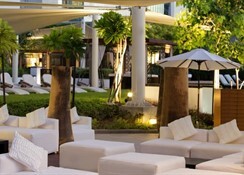 Get yourself spoiled with worldwide inspired cuisine and exceptional culinary concepts with classy surroundings. 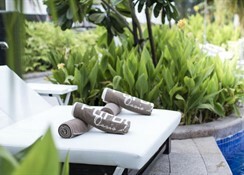 The hotel also offers In-room food service menu on a 24-hour basis that include breakfast, lunch, dinner and snacks. 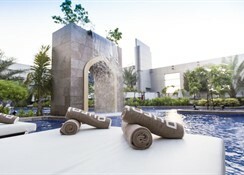 At Conrad Dubai, you have the choice to indulge in wide-ranging fitness and spa options. Hit the Poolside Urban Oasis, where the attractively cropped gardens, desert palms and succulents surround the landscape pool. 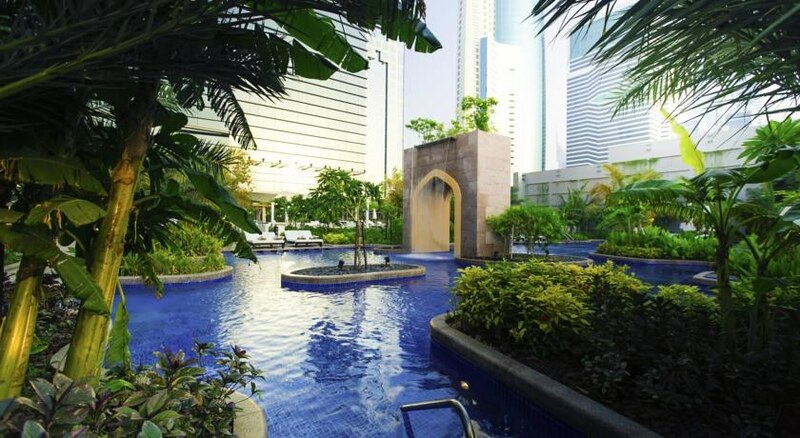 This is an ideal spot for enjoying a refreshing swim or unwind yourself with a cocktail while envisioning a fairy-tale Arabian sunset. Elevate to the higher ranges of physical well-being by hitting the fully-fledged fitness centre with the latest equipment’s. 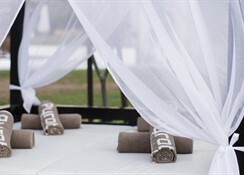 There is an outdoor yoga pavilion, where you can attain your spiritual well-being. Head to the relaxing spa at the hotel for relaxing in a calm atmosphere and take pleasure of an astonishing selection of signature treatments.